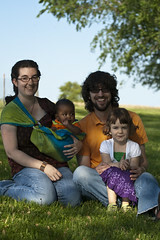 Way back in June we did a family photo shoot with Barbara O’Brien at her White Robin Farm in Wisconsin. It was a beautiful drive out there (I think I missed a turn and took a longer, more scenic detour) and we had a lot of fun doing a relaxed, non-studio family photo shoot. And I finally got around to posting the pictures: Check ’em out. When we pulled up and got out of the car Lexi was all excited about the few cats milling about the yard. Then Barbara started calling the cats and they just started pouring out of the barn. She has at least 25 cats, and most of them came when she started calling. In addition to the cats, Lexi chased the chickens, fed the horses and held a baby duck (she also manhandled the kittens and baby chicks). We got to run around, have some fun and the whole time Barbara took lots of pictures.